Director/writer Martin McDonagh's crazy crime comedy "Seven Psychopaths" is more of a screwball farce than his darkly brilliant 2008 "In Bruges," which mixed a bit of unexpected poignancy with its high-firepower hijinks. Colin Farrell stars in both, playing a non-violent straight man here instead of a lowbrow rookie hitman. But even as the sanest person onscreen for a change, Farrell is so likable and fun to watch that he never gets lost amid a colorful cast of entertaining maniacs. Farrell is Marty, a blocked Hollywood writer whose latest project is overdue. His out-of-work actor best friend Billy (Sam Rockwell) desperately wants to collaborate with him on an unfinished-because-it's-unstarted screenplay called "Seven Psychopaths" that Marty says he wants to be "life affirming." Marty also has a frustrated girlfriend (Abbie Cornish) and a drinking problem, which Billy points out is part of his heritage. "The Spanish have bullfighting, the French have cheese and the Irish have alcoholism," he helpfully explains. The characters Billy comes up with for the screenplay turn out to have actual counterparts of various violent dispositions, erasing the line between reality and what Marty thinks is only fiction. This "Adaptation"-style movie-within-the-movie-becomes-the-movie vibe is cleverly handled, eventually putting Marty in the center of an unlikely action flick that becomes increasingly more preposterous. To pay the bills, Billy and the cravat-wearing Hans (a deadpan delightful Christopher Walken) make money by stealing dogs to return for rewards. Problems arise when they nab a beloved Shih Tzu that's obsessively adored by psychotic gangster Charlie (Woody Harrelson), a menacing thug who is not above putting bullets in heads to get his dog back. Supporting characters such as a bunny-stroking killer of serial killers named Zachariah (the always appealing Tom Waits) and an intimidating Quaker agent of vengeance (Harry Dean Stanton) are given their own pulp-fiction vignettes. A hilariously over-the-top graveyard shootout fantasy includes unforgettable moments such as Hans rising from a coffin with guns a-blazing. Farrell's overwhelmed Marty spends most of the movie looking flabbergasted and hilariously exasperated as he tries to be the voice of reason in a world gone murderously mad. The movie's one weak spot is Rockwell, who has a tendency to be Robin-Williams-level annoying as the dangerously hyperactive Billy. What's odd is that the first actor who comes to mind as someone who could have done a better job with the Billy role is Farrell himself, who could have made being insanely needy less obnoxious. Writer McDonagh includes lots of in-jokes and Hollywood jibes, some at his own expense, such as a reference to bad women characters in Marty's movie. Three of the females here have little to do besides complain, get shot, kill people or look good in a wet T-shirt, although a tender subplot about a breast-cancer patient offers the closest thing to a genuinely human moment in the film. The best thing about the plot is its unpredictability and bizarre but fascinating tangents, such as an aside about a self-immolating Vietnamese monk. 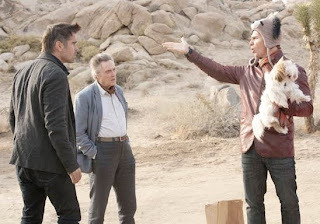 "Seven Psychopaths" is so interesting, funny and wonderfully strange that it's likely to get McDonagh his second original-screenplay Oscar nomination (after "In Bruges").